CONDITIONS OF SALE: It has to be exhibited free of charge each year during the Jewish holiday of Passover, as well as the Muslim Ramadan. STORY: This very small canvas tries to tackle one of the biggest problems of our time, the Israeli-Palestinian conflict. 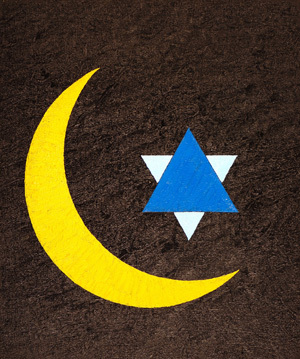 It is almost a typical presentation of the star and crescent symbol, which is commonly found on flags and other emblems of many Muslim nations, except that a more common pentagram is replaced with two superimposed blue triangles (a stylized Star of David). Even though this modified star and crescent is not completely original, as it can be found on coat of arms of several European cities, its usage to promote peace is certainly within the AbFab boundaries. The price reflects the number of years (in millions of dollars) this conflict lasts, and it will go up by one million every year until the conflict stops. After that it will go down (if not sold before) every year, until the price becomes zero, at which point it should be publically lit. At that point most living Palestinians and Israelis will not have a living memory of the conflict anyway.